The honor guard marches into the Pavilion Hill tent to begin the ceremonies. The opening ceremony included the Pledge of Allegiance, “The Star Spangled Banner,” and a 21-gun salute. Abraham Lincoln impersonator John Cooper addresses the crowd at the annual veterans dinner. Cooper, a Baltimore, Ohio native, has been a professional Lincoln presenter for the past nine years. 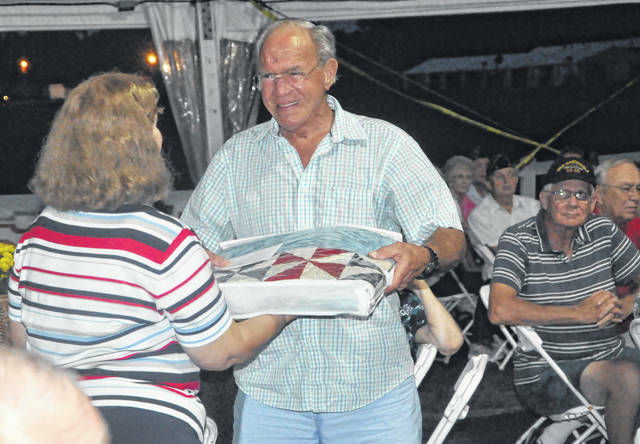 Delaware resident Carl Kaszowski is presented with a quilt at the 2018 Operation Forever Grateful veterans dinner at the Delaware County Fairgrounds on Friday night. Fourteen veterans were randomly selected to receive quilts, which were crafted by a group of residents from the Waldo area. 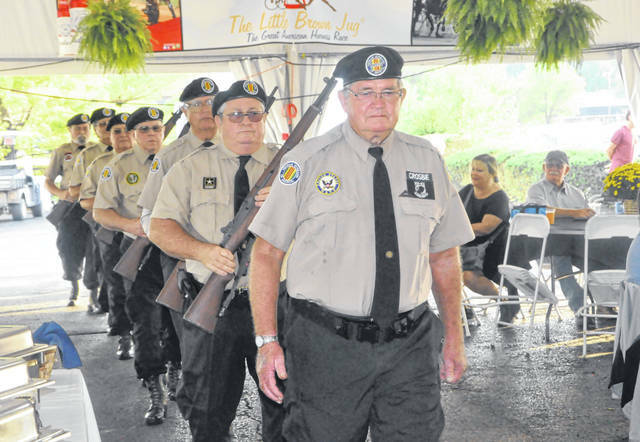 The Delaware County Fair held its annual veterans dinner at the fairgrounds on Friday night. Held in the Pavilion Hill tent, east of the race track, approximately 400 veterans, family, and officials from around Delaware County gathered to honor and celebrate the duty and sacrifices of former servicemen of the area. Jennifer McGowan, co-chairing the event for the first year after assisting in the past, said the event has been held for over 10 years, and that it seems to grow each year. All Occasions Catering provided the food for the evening, as it has for many years. McGowan said the business is great to work with, offering a discounted rate because of the veterans. 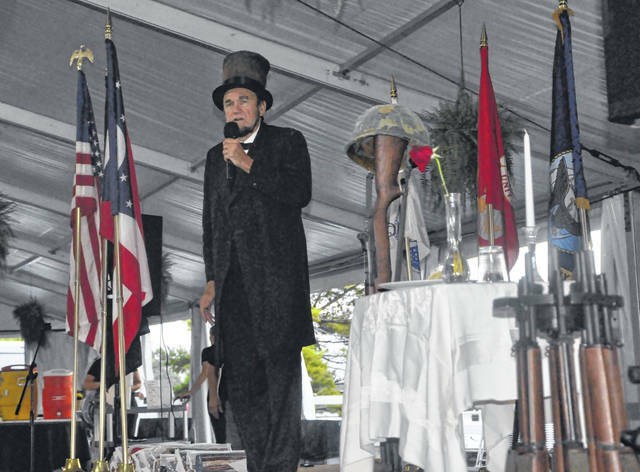 After dinner was served, the ceremony began with a speech from Abraham Lincoln impersonator John Cooper, who told stories of his own time spent in the service before becoming president. Cooper finished up by reciting Lincoln’s famed Gettysburg Address. Following Cooper’s speech, the Delaware County Board of Commissioners (Jeff Benton, Barb Lewis and Gary Merrell), which sponsored the event, each took the microphone to offer their thanks to veterans, as did Delaware Mayor Carolyn Kay Riggle, state Rep. Andrew Brenner, and Honor Flight Columbus Co-Founder Susan Barr. Barr said the Columbus Honor Flight chapter has taken 90 trips this year, transporting over 5,600 local veterans, several of whom were in attendance at the dinner, to Washington D.C. to see their memorials. Barr added that nationally, the Honor Flight program has flown more than 225,000 veterans to the nation’s capital this year. To wrap up the ceremony, 14 veterans’ names were randomly called to receive specially crafted quilts as a thank you for their service. The quilts were made by a group of residents from the Waldo area who donated their time to make the gifts. The group is not new to showing their appreciation through handmade quilts. In August, 31 veterans from Marion, Delaware and surrounding areas were each honored and presented with a quilt at an Honor Flight at Home ceremony in Marion. Winters, who has served on the Delaware County Agricultural Society Board of Directors since 1991 and co-chairs the dinner, said she was extremely pleased with the turnout. To get the word out to as many veterans as possible, Winters said she personally delivered the registration forms to places such as the Eagles, Moose, and AmVets clubs, knowing the older generations might not see the forms online. There is considerable work that goes into planning the event, Winters said, adding the planning has already started for the 2019 event. However, Winters said, it’s the very people they are honoring that makes the event possible to begin with.